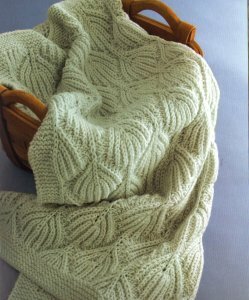 Taken from 60 Quick Baby Knits: A lovely baby blanket that will look spectacular in any crib! This pattern is in 60 Quick Baby Knits, page 16. Size US 6-36" circulars are required but not included. Finished Measurements: 28" x 31.5". Gauge: 19 sts over 4". Color Shown is #1914 Alaska Sky. $55.00 -- Kit price including yarn only (no book or pattern). $72.95 -- Kit price including yarn and pattern book.